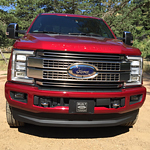 The Tough 2019 Ford Super Duty | Karl Flammer Ford Inc. If you're looking for a truck that can handle anything you throw at it, take a look at the 2019 Ford Super Duty. This popular heavy-duty pickup truck is built from the frame up with durability in mind. Ford has engineered the body of the truck to make it ready for any challenge. The frame is made from a high-strength steel. It's fully boxed and features 10 cross members for added strength. The cross members help to prevent structural twisting. The body of the truck is made from an aluminum alloy material. The military grade material is resistant to physical damage and isn't affected by red rust. It's also much lighter than previous models. Want to learn more about the 2019 Ford Super Duty? Stop by Karl Flammer Ford Inc. in Tarpon Springs today. We'll be happy to set you up on a test drive so that you can see how tough this pickup really is.